The stein features a scene in the Black Forest region of Germany. The clock maker and a woman in traditional costume are in front of a water mill. The word SCHWARZWALD (Black Forest) is located below the clock. The unique handle has a cuckoo clock vendor. 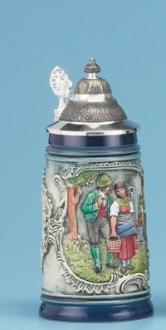 This 1/2 liter stein is about 9.8 inches tall.